#15 - JULIE LONDON, Wild Man Fischer, Twist Records, the Nuclear Whales Saxophone Orchestra, Xmas Compilation Craziness, Recordings You Don't Need To Hear A Second Time, and the record stores of Portland, OR. 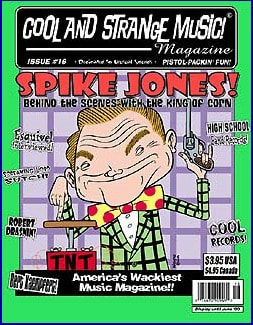 #16 - SPIKE JONES, Bert Kaempfert, Esquivel, High School Band Albums, Robert Drasnin, Screaming Lord Sutch, Wendy Mae Chambers, Polka LP covers, and the record stores of Victoria, BC. 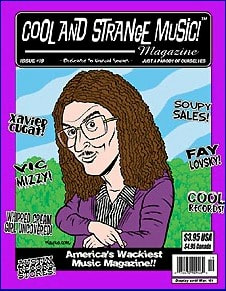 #19 - "WEIRD AL" YANKOVIC, Fay Lovsky, Xavier Cugat, Vic Mizzy, Jean-Jacques Perrey, Music-Inspired Guides to Drinks & Dining, Soupy Sales, Dolores Erickson (Herb Alpert's Whipped Cream cover girl), and the record stores of Austin. 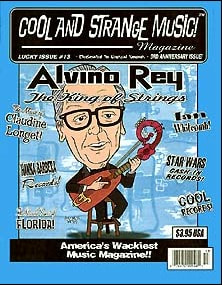 #20 - BILLY MAY, Florence Foster Jenkins, Mickey Katz, Jonathan Richman, Sergio Mendes, Fake Soundtracks, Lynn Carey, Twang Bang, Latin LP Covers, and the record stores of San Francisco. 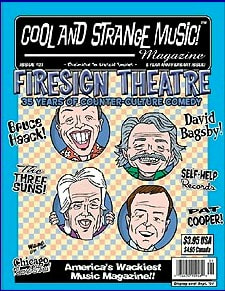 #21 - FIRESIGN THEATRE, Bruce Haack, Kiddie Records, The Three Suns, Pat Cooper, Self Help Records, David Bagsby, Seeco Record Label, and the record stores of Chicago. 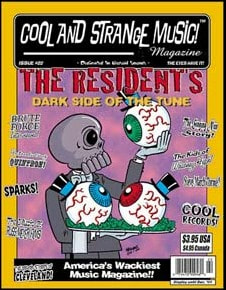 [see contents]#22 - The RESIDENTS, Brute Force, Sparks, The Music of Russ Meyer's Films, Quintron, Soeur Sourire - The Singing Nun, Steve March Tormé, The Kids of Widney High, Vic Flick, Arthur Fiedler Album Covers, and the Record Stores of Cleveland. 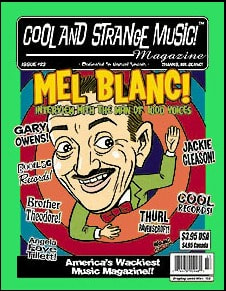 #23 - MEL BLANC, Langley Schools Music Project, Jackie Gleason, Gary Owens, MAD Magazine Records, Brother Theodore, Ray Conniff, Angela Faye Tillett, Bootleg Albums, Thurl Ravenscroft, and the Record Stores of Detroit. 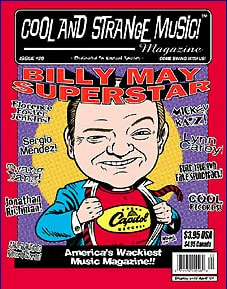 #24 - WENDY CARLOS, Eartha Kitt, Jean Shepherd, Big Daddy, Rusty Warren, Moog Custom Engineering, Israel Kamakawiwo'ole, Frank Sinatra Jr., Bollywood Album Covers, Evolution Control Committee, and the Record Stores of Seattle. 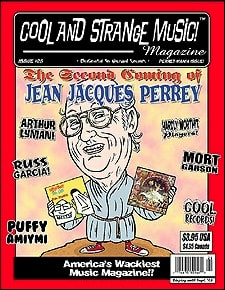 #25 - JEAN JACQUES PERREY, El Vez, Arthur Lyman, Russ Garcia, PAMS: Jingles A Go-Go, Mort Garson, Puffy AmiYumi, The Hardly Worthit Players, Ed Kaz's Box of 45's, Copycat Album Covers, and the Record Stores of Oklahoma City. 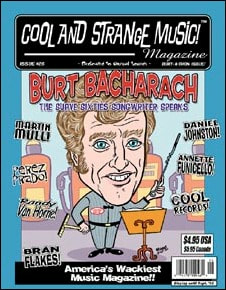 #26 - BURT BACHARACH, Daniel Johnston, Music to Travel By, the Bran Flakes, Randy Van Horne, Martin Mull, Perez Prado, Annette Funicello, Religious record covers, and the Record Stores of Nashville. 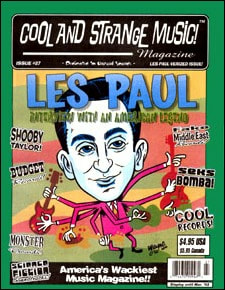 #27 - LES PAUL, André Popp, Shooby Taylor, Budget Label Classics, Seks Bomba, Monster Records, Cool and Strange Xmas LP Covers, Sci-Fi Soundtracks, Fake Middle East Records, and the Record Stores of the Northwest United States.